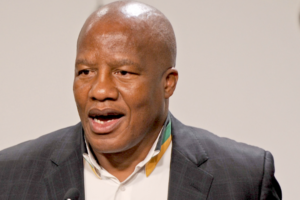 Jackson Mthembu is a South African politician who was born in June 1958 in Witbank in South Africa. He is a former national spokesperson for the African National Congress. He was born in June 1958. As of the year 2018, he 60 years old. Comrade Mthembu’s mother, Nantoni Rosie Mthembu, affectionately known as Gogo Mthembu, was born on 01 January 1939 and died on 26th February 2018. He is married to Thembi Mthembu, with whom he has six children. He has two daughters; Thuli and Khabo and four sons. His eldest daughter, Khwezi Mthembu committed suicide at the tender age of 25 on the night of the 19th of March 2019. Full details about his estimated net worth are yet to be updated. 1986 – 1988: Production Foreman, Highveld Steel, and Vanadium Corporation Limited. 1980 – 1984: Training Officer, Highveld Steel, and Vanadium Corporation Limited. 1980 – 1986: Chairman of Witbank Educa­tion Crisis Committee. 1988 – 1990: Deputy Regional Secretary, United Democratic Front from. 1997 – 1999: Member of the Executive Council of Public Roads and Transport, Mpumalanga Provincial Government. The eldest daughter of ANC chief Jackson Mthembu has committed suicide, her hurting father has disclosed. “We are in deep pain,” he said. In an interview with 702 Mthembu said his son had been treated at least six times at addiction centres, and through counselling, they had learned that his son had become an addict while in Grade 7.